A solar roof system from Roofmax offers complete renewable and energy efficiency solutions for homeowners who want to take more control of their energy supply. 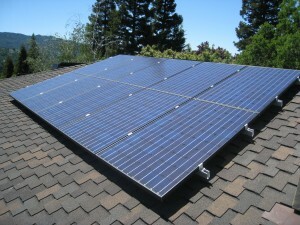 We are among the leading solar roof contractors in the East Bay Area. A residential solar power system is relatively simple and efficient. 1. Roofmax solar roof systems are made up of photovoltaic (PV) solar panels, which are attached to the roof on specially designed racks. 2. The photovoltaic (PV) solar panels capture and convert sunlight into direct current (DC) electricity. 3. The DC electricity is collected and fed to an inverter, which converts the DC electricity to alternating current (AC), the type of electricity used in your home to power your lights, air conditioning, and other electric appliances. 4. The AC electricity is fed into your home’s electrical panel (breaker or fuse box) where it is then sent throughout your home. 5. When your solar system is producing more electricity than you are using, this excess power flows into the power grid through your electric meter. This gives you a credit with the utility company, which means that you are lowering your monthly bill. You remain connected to your electrical utility to provide you with electricity when your home solar power system isn’t producing, or when demand exceeds capacity. But when your home solar system generates more electricity than you use, the extra power is sent to your utility company and you receive a credit. During sunny summer days, you might see your electricity usage dial spin backwards!